Miles O'Brien from the mirror universe abducts Commander Sisko in order to get his help infiltrating the Alliance and rescuing the mirror version of his wife, Jennifer. It's a good thing they managed to get the same actress to play Jennifer Sisko from "Emissary." Sisko falls into his role a little too easily and a little too well. Goddamn, Terry Ferrell (Dax) is distracting in that outfit. It is pretty dangerous for Sisko to assume that Jadzia is still "Dax," given that he doesn't actually know that this alternate reality version is conjoined. There's plenty of none-too-subtle parallels to Nazi Germany from the Alliance, but my favorite are the Earth badges all Terrans must wear. I don't have a lot to say about this one. The parallel universe is fun and I'm glad the writers are continuing to roll with it, but there's not much going on outside of a good ride. 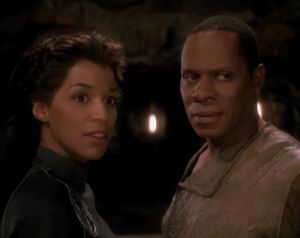 Sisko meeting up with the alternate reality version of his dead wife is pretty cool, but as character development, it's kind of spinning its wheels. Still, a perfectly acceptable adventure.